On 8th September, the meeting of "Brand Strategy of Dayu Jiuding 23rd Anniversary and the Promotion of Baixiniu Waterproof System" was successfully held by Dayu Jiuding New Material Technology Co., LTD in the zhongyuan hall of Zhengzhou East Dimension Hotel, and the curtain of the national promotion of Baixiniu waterproof system was officially opened. 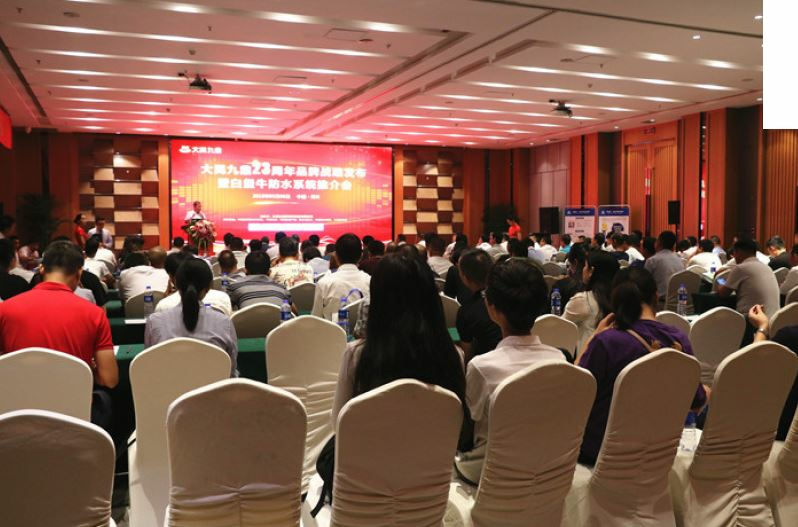 The meeting invited more than 200 guests of leaders from major relevant industry associations, real estate, design institute, owners, general contractors, project managers, distributors and other related organizations in north China to attend the event. Henan Provincial Building Waterproof Association president Chen Baogui attended the event and delivered a speech, Pingyu Waterproof Association also sent in their congratulations. At the same time, the conference was widely publicized and reported by many domestic media and industry authorities, such as China Building Waterproof Association, China Building Waterproof Magazine, China Real Estate Newspaper, Waterproof and Construction, China Waterproof Report, Sina Real Estate, China Waterproof Online, and Jiuzheng Building Materials Website. At the meeting, CEO Jin addressed: "This seminar brings us Baixiniu waterproof system which has realized a lot of technical breakthroughs. No matter from the standpoint of green environmental protection, waterproof performance or fuel economy requirements, this system has taken into consideration all aspects, such as improvement and upgrade. This system is the pride of Dayu, and also a good news to building waterproof industry. In 2017, as Baixiniu TPO system came out, we Dayu brought waterproof technology to a new height. The system’s core material is an imported TPO raw material, and all materials are processed and produced by our own factory, thus guaranteeing the product quality and sufficient supply. Chen said that Henan infrastructure development is fast, waterproof market has great potential. Baixiniu TPO waterproof adhesive system conforms to the requirements of the green ecology, and thus is recommended to be used in municipal engineering, like the subway, underground pipe rack, etc.. Advantage one, green environmental protection, high strength endurance. Baixiniu TPO polymer adhesive waterproof system adopts imported TPO as core material, without adding asphalt, using cold construction, environmentally friendly. All Performance indexes of Baixiniu TPO waterproof membrane have been optimized and upgraded from the national standard. The tensile strength, elongation at break, and weather resistance to high low temperature achieve excellent breakthroughs, having good adaptability for complex conditions, effectively improving the overall waterproof performance. Advantage two, node optimization, compact and reliable. Baixiniu waterproof system has wet construction and pre-laid construction two types. Respectively the overlaps, prefabrication for nodes and etc have comprehensive optimization, minimizing construction leakage hidden trouble and improving construction efficiency at the same time. Advantage three, comprehensive system, cost-effective. Baixiniu waterproof system has comprehensive consideration in material selection, process optimization, auxiliary materials, technology display and control and so on. Thus the system can be widely used in both industrial and civil construction roofing, underground space, city subway, urban underground pipe rack, highway traffic tunnel, etc, with high cost performance. Voice from architectural designers: Baixiniu waterproof system will be the mainstream of future building waterproof design trends. The conference invited many architects and designers from north China. They were very interested in Baixiniu waterproof system and admitted technology solutions and related professional knowledge exchange at the conference was very practical. Baixiniu waterproof system has designed a very detailed scheme for planting roofing, underground engineering, comprehensive pipe gallery, highway and railway tunnel, industrial and civil buildings, which is very comprehensive and practical. At the same time, regardless of the comprehensive consideration of green environmental protection, durable protection, convenient construction and cost, etc., there is no doubt that Baixiniu is a good choice for building waterproof engineering, especially for large-scale municipal engineering projects with high requirements on waterproof grade and complex construction environment, Baixiniu may be the mainstream trend of building waterproof in the future.